I’ve added a new mineral foundation to my natural makeup collection, but I swear this one is different than anything I’ve tried before. If you’re already a Kari Gran makeup fan, you probably know what I mean. This mineral foundation is flat-out fantastic. In the photo comparison above, on the left, I am obviously not wearing any foundation (but have on my brows and some lip color to keep from scaring you). I’m wearing only Kari Gran mineral foundation all over my face. No base layer of concealer or any mineral veil. 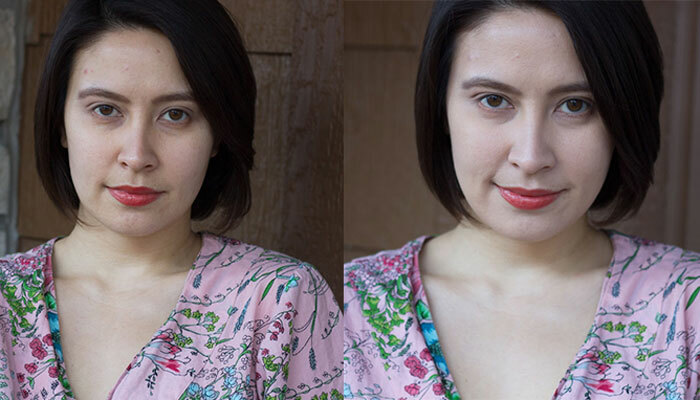 While the photo on the right shows a much evened-out complexion, I’m still not too happy with the dark-ish circles under my eyes. That’s just sleep deprivation at it’s finest, though. I was on five hours of sleep in this photo. Perhaps a base layer of thick concealer could have helped, but I’m all about the honest foundation reviews! (And I should become all about getting more sleep.) I bet if I had my typical seven hours, those undereye circles wouldn’t be so prominent. What sets Kari Gran’s mineral foundation apart from other mineral foundations I’ve tried is the instant glow you get upon application. We beauty bloggers tend to through around the word “glow” a lot in our reviews, so let me be more specific: Because of the subtle amount of mica in this mineral makeup’s formula, you seriously get that beautiful, radiant complexion that’s not shiny or glittery. It’s just glowy. And that’s that. Obviously, if you avoid mica in your beauty products (I don’t), then this isn’t the foundation for you. If you’re used to using a highlighter everyday, you can get rid of that step when you use Kari Gran’s foundation. The light-reflecting effect is built in to this foundation, so all you need to do is buff it in and go. I absolutely love this foundation! But seriously, what sets it apart is the glow. I can’t help but admire the way my skin looks after using this mineral foundation. It’s just beautiful, and when I go back to using my other beloved minerals, I get a little annoyed that I need to layer on the highlighter to my glow. Speaking of layering on makeup, I stumbled upon this fantastic refresher course on how to apply your mineral foundation the right way. We all know that we should apply sparingly and build, build, build for even coverage, but sometimes it just helps to see someone actually do it. Let’s not waste our makeup, ladies! So, are you cool with using mica in your beauty products? Have you tried Kari Gran’s mineral foundation? What are your favorite natural foundations (and what color do you wear?)? Tell me in the comments section!